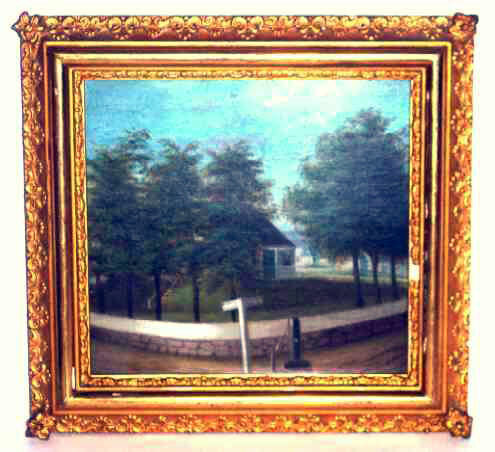 Presented here, a charming little Oil on Board of a mid 19th Century Cape Cod Scene. At the crossroads in front of the house there is a pump for watering horses. The signpost in the foreground reads Hyannis and Wellsfleet. The painting is framed under glass with spacers so it is in outstanding condition. Framed in an ornate gold frame the picture measures 10" x 10-1/2" overall and 7" x 7-1/2" (sight). A fine little 19th C. Folk Art painting.